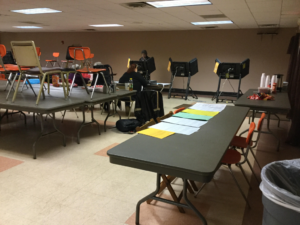 FOLLOW POINT PARK UNIVERSITY STUDENTS THROUGHOUT THE DAY AS THEY REPORT IN FROM POLLING PLACES AROUND WESTERN PA.
McMullen at the voting booth. Photo by Brandi Ogrodowski, Point Park News Service. Deborah McMullen, 54, arrived early to vote at Resurrection Church in Pittsburgh’s Brookline neighborhood before work to make sure she could act out her civil duties as a citizen. “I don’t think in people’s minds they think about how important it is to vote for a judge, until they have to go in front of a judge,” she said. Polling places throughout the state opened this morning at 7 a.m.
Nathan James King, 23, said he has been at the Brookline polling place with his mother for every election since 2012. King said he does not believe that age affects how many people show up to the election, rather that it’s a bigger issue that only 25 percent of registered voters actually go out to vote. “We are only expecting the diehards,” he said. McMullen said she agrees demographics mean less than overall interest for an off-year election. Voters today are choosing among candidates for judges and local public roles such as mayors, city council members and school board officials. Before Dwayne Woodruff kicked off his campaign to run for justice of the State Supreme Court, he played for the Pittsburgh Steelers. Currently a judge in Allegheny County’s Common Pleas Court, Woodruff is running against incumbent Sallie Mundy for the position on the Supreme Court. Mundy already serves as a Associate Justice on the Supreme Court. Voters turned out despite the cold and rainy weather, however, the turnout at some locations hasn’t been great, poll workers said. “It’s pretty slow. Not like the presidential election of course but people are coming out to vote,” said Joelle Cato, Judge of the Election Board at a polling place inside the Epiphany Church, which serves residents living downtown and Uptown. Although the turnout at the location wasn’t massive, Cato said she also thinks that people are probably more inclined to vote for Woodruff because of his past with Pittsburgh sports. “The more familiar you are with the name then most are going to go for that. Depending on what you stand for,” Cato said. Allen Washabaugh, of Houston Township, voted at the North Strabane Township building located on Route 519 in Canonsburg because he feels local elections are important. “I feel that if you don’t vote and then complain about what goes in your community, state, or federal government, you’re a part of the problem,” Washabaugh said. A non-presidential election year, like this year’s, deals with voting on judicial positions, local county races and taxes. Nate Eisinger said he feels it’s critically important to exercise his right to vote in all elections, especially in off-years where he feels his vote carries more weight because of the lack of participation. He feels that the bigger issue though is that people don’t care. 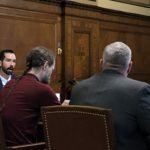 “Where I grew up [in Charleston, W.Va.], the local newspaper sent out questionnaires to all the candidates on many issues and they would then publish these answers so that the public was more informed,” Eisinger said. 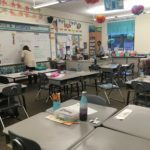 Eisinger said this year is different compared to the last election because everyone had strong feelings about President Donald Trump and Democratic candidate Hillary Clinton, local elections give voters less of an opportunity to learn about the candidates. Caroline Norton, 24, made her way to the voting poll at the Epiphany Catholic Church located in Pittsburgh’s Hill District during her afternoon to perform civic duty to better help her community. “I’m a strong believer in voting whenever I have a chance to and making my voice be heard. I think there’s a lot of issues in our political parties and I can’t change them, so I do what I can,” Norton said. The Epiphany Catholic Church polling center was open to the public from 7 a.m. until 8 p.m.
“It’s been pretty slow, it’s not as busy as presidential elections of course, but people are coming out, ” said Joelle Cato, Judge of Election. Cato said she believes that the weather had an effect on polling attendance. “Nobody wants to get out of bed for the rain, so hopefully the election is enough,” Cato said. Norton said she had a difficult time finding information about the candidates and information on the positions that were up for election. “I found it hard to find out who these people were and what their stances were, so I voted strict party,” said Norton. Norton feels that the use of social media is a huge influence on voting especially when it comes to the municipal election. Voters today are starting to be of younger ages and as younger generations use social media more, advertising is starting to peak on those platforms. Erin Heintzinger has been going to the polls before she was even old enough to vote. Her mother ran their local polling station, and that began her 20-year love affair with performing her civic duty, and helping others perform theirs. One year after Donald Trump’s election to President of the United States, an election which drew 59.7 percent of eligible voters, polling stations for local elections are looking rather bare in comparison. Heintzinger, 38, is the judge of elections for Pittsburgh District 15, precincts eight and 10, and has been doing so in this location for five years, but she became a judge in 2008. At around 6 p.m., the church basement was filled with all six stations being filled, and a small line forming. Heintzinger estimated that a little over 100 of the 600-something registered voters in the area had turned out. “Anything over 130 and we’re happy,” Heintzinger said. Among those hundred was Barry Germanoski, 45, who has been a registered voter since he was 18. Germanoski wishes that more people would understand the importance of local elections. As the president’s popularity has declined, the importance of electing local officials and representatives has become more prominent, but the turnout seems to have remained the same.